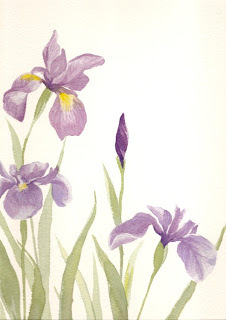 Don't these irises look regal against the white background? This is as close to an oriental style as I will ever get - I guess it isn't really oriental at all, but for the subject matter and the white background. It's showing up a little yellowish in my browser, but it is white! I've always wondered if I should add a butterfly, one of those pale blue tiny ones that dance in the spring, but I feel the painting is complete without it, and the white space to the top right brings balance to the flowers clustered to the left. My favourite thing about this painting (and I'd better type fast cause I hear baby cooing in his crib) is that I accomplished what I had set out to do. I had been doing a lot of free, fast, wet-in-wet florals prior to this, and I needed to step out of that and stretch my creative muscles with something different. I wanted to stay very detailed, very botanical, and I did that, and completed a painting I'm quite proud of. And I think that if I were a flower, I would like to be an iris, graceful and tall, like Grace Kelly. This painting is available for purchase. It is approx. 8.5" x 13" and is professionally framed.